I am definitely satisfied with what I received in the box - and it exceeded my expectation. I knew what I was buying but it turned out much better in this desktop. I’ve got Antec Nine Hundred case - it’s pretty big and has a lot of space inside, it can fit many more hard drives and another one or even two videocards. Everything works well, I have got overclocked processor and all hardware is up to specs, seems like pretty good assembly quality. I played with it for more than a month without problems. Review: Thank you so much for the computer you have built for me! I was amazed at the quality and fast delivery of this computer. I had not the best experience with another company that wasted one week of my time and couldn’t even tell me when they would ship. Centaurus delivered my computer in less than a week! Inside the machine I have superclocked AMD Phenom processor - it’s quad core and it was clocked to 3.75Ghz - I would never hope to get something like this! Temperature of the CPU during gaming never exceeds 50’C. 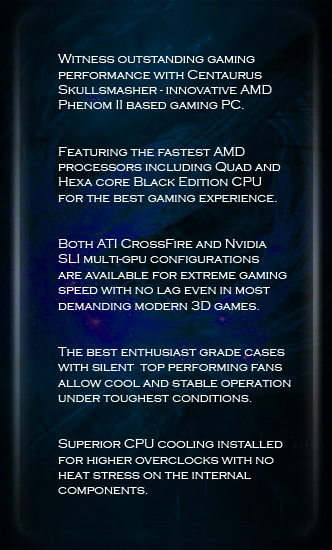 I also ordered two ATI 5850 videocards in CrossFire and 4GB DDR3-2000 RAM. With that configuration I can play Crysis maxed out on 1980x1080 resolution, Call of Duty MW2 runs with 16xAA above 60+FPS all the time. This computer is amazingly fast, I don’t know any games or applications that would slow it down at least a little bit. And I don’t think I will need another gaming computer for 2-3 years at least, then I will come back here to get another one. I like getting the best stuff in the world and it certainly feels like it here. By the way all the hardware inside is high-end. AMD 890FX motherboard from ASUS is my favorite, memory is G-Skill RipJaws with awesome red rigged heatsinks. Videocards are from Sapphire Tech. 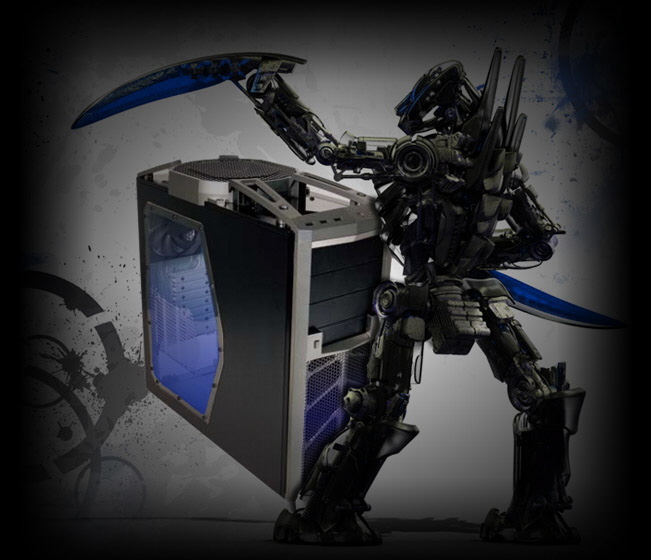 Everything looks amazing in Antec Six Hundred case. All these hardware manufacturers are the best at what they do and I’m happy to have it all in my computer. Review: I have purchased this computer to play World of Warcraft and other occasional games. I don’t know much about the insides of the computer and I have certainly enjoyed very easy and understandable computer customization and ordering process. I did not have any troubles at all, but decided to call to check on the configuration I was about to order - Alex explained every detail and gave recommendations that helped me to make the right choice. They kept me updated through the whole process and I received computer sooner than what website listed as a delivery estimate. Right now I am running WOW on maximum settings even with max shadows that was not possible on my previous computer even close. Computer have got much better within the last few years as I see it. I do not see any lag even in Dalaran in the busiest hours. WOW seems much better than before, I have enabled 16x AA too. Quite a few times I was just sitting on some mountain or hill or tower and watching the sunset, beautiful water, weather effects. I can tell that I enjoy all my games much more now. And this computer will be as great when Cataclysm will come out - with all new water effects and more. Greatest computer with a great price, like I said - worth every penny!